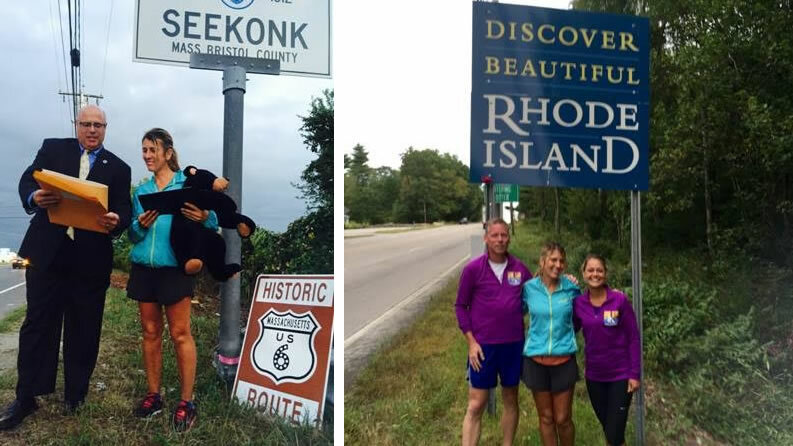 Aprylle’s RUN ACROSS AMERICA along US Route 6 to Provincetown MA (3,652 miles) will be placed in the record books – NO PERSON has ever accomplished this previously. She is running the 1940 alignment from the waterfront in Long Beach, California to the waterfront in Provincetown, Massachusetts which is located at the tip of Cape Cod. She started her run on May 11, 2015. TEAM APRYLLE projects that Aprylle will cross the Finish Line of “Aprylle Gilbert’s Historic Charity Run 2015” along US Route 6 in PROVINCETOWN MA on TUE – SEP 15. We are humbled by the requests from hosting sponsors, for appearances, and offers of donations to Aprylle’s Charity Run For Kids, accommodations of lodging, meals, fuel for her support driver and other services from Corporate Sponsors, Individuals, numerous Running Clubs & Groups, as well as small town & large city (major chain) hotels, area exclusive hotel properties, bed and breakfast properties, resorts, conference center hotels, ‘mom & pop’ motels, B&B’s, etc., Convention and Visitors Bureaus, Chamber(s) of Commerce, Mayors of cities, villages, townships, and towns, area School Principals and Coaches, officers of service clubs; i.e. : Rotary, Knight of Columbus, etc. have & are graciously providing their support. It is my humble privilege & honor to assist in providing logistical support for Aprylle Gilbert and Jose’ A. Reyes, her “Lifeline Support Driver”. Commercial merchants will find significant tax benefits, as described below, and in the attachments included in this e-mail. Daily updates are posted at http://route6tour.com/happenings/category/us-route-6-charity-run/, ‘Twitter’, Facebook, “blog” sites, and Association Member’s e-mails, etc. Bob Gillie liked this on Facebook.